Nancy Mion, our Empire State Virtual Branch Public Policy Director and AAUW Islip Area Branch Long Island Suffragists Committee Chair. Nancy comes by this naturally for her grandfather, Nathaniel Schmidt, a professor at Cornell, was an active suffragist. She is a member of the statewide NYCHTN Women, Right’s Committee. Nancy is currently: Islip Area Branch Program Vice-President & Public Policy Director; L.I. 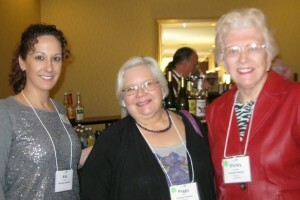 Interbranch Secretary/Treasurer; NYS Legal Advocacy Fund (LAF) Director; and a National AAUW LAF Committee Member. She is a past NYS President and Public Policy Director. She has been an involved dedicated committed AAUW member for 40 years. Her other abiding interest is the Suffolk County Coalition Against Domestic Violence. 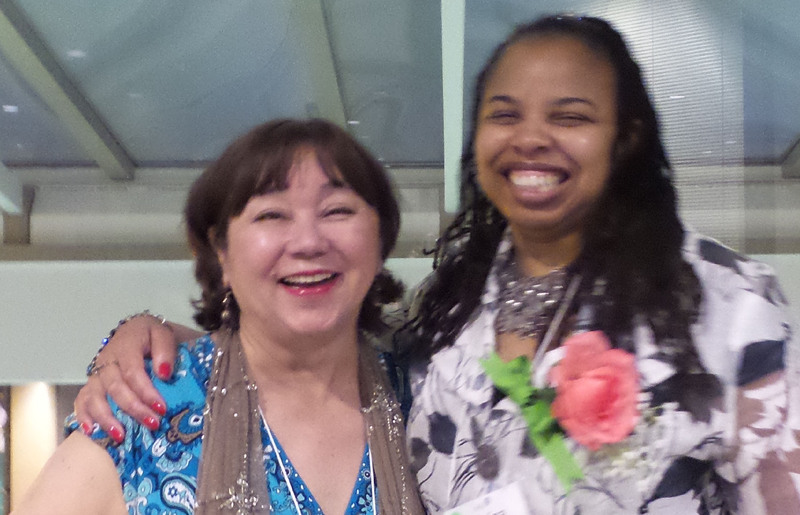 Nancy was a librarian who received her BBA in Management from Hofstra University and her MS in LS from SUNY Albany. If you would like a copy of Nancy’s Powerpoint presentation on the history of the suffrage movement especially as it applies to New York. Contact Nancy Mion at myown220@aol.com. If you were not able to attend Joan Monk’s presentation about Eleanor Roosevelt and Leadership: “Eleanor’s Alphabet Soup”, you can e-mail Joan at ftmaven@gmail.com about interesting program(s) for your branch. As you know, Joan is a fairy tale/happiness/play enthusiast engaging students of all ages in what has heart and meaning for her. With an e-mail moniker of ‘ftmaven’ she has been dubbed the “AAUW NYS Unofficial Director of Whimsy” because of her passion for fairy tales. As the former Education Director of the Peter Pan Children’s Fund, she has unlimited access to pixie dust, sprinkling it wherever she goes! Her latest fairy tale endeavor is “The Wonder & Wisdom of Oz,” celebrating the 75th Anniversary of America’s favorite fairy tale with students from age 4-104. As a Master Teacher in the Yonkers Public Schools, Joan “worked her magic” lovingly there for nearly four decades. 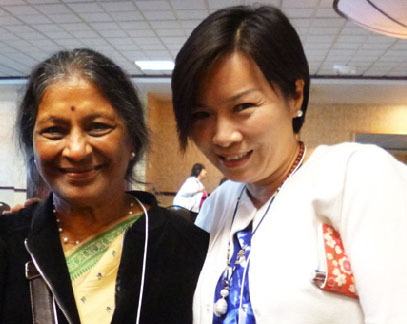 She considers herself “an inspired not retired” educator, having worked as an early childhood teacher, parent trainer, workshop leader and college professor. Now she is putting put volunteer work center stage in her encore career. Jacob Burns Film Center, Westchester Children’s Museum and The Academy for Character Education at Sage College all benefit from her energy and enthusiasm. 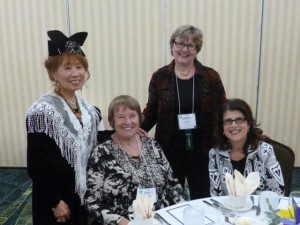 Inspired by the mission of AAUW, she joined as a ‘lifetime member” twenty years ago. She is a member of four branches in NYS: Westchester, Kingston, Poughkeepsie and ESVVB. 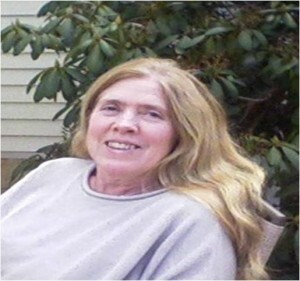 At present, Joan is Special Projects Director, District V Coordinator and is chairing the NY/NJ WILD Project. She served as District Director, International Affairs Chair and Cultural Interests Director also. She lives in Yorktown with Rob the prince, Toto the dog, and Mushy the cat. This entry was posted in AAUW NYS Convention and tagged AAUW, Economic inequality, Education, Gender pay gap, Get out the vote, Human trafficking, International Day on September 13, 2015 by drrani. 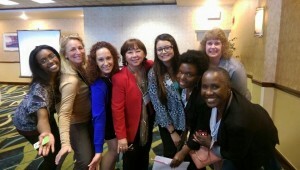 Congratulations to the AAUW NYS Convention Team! 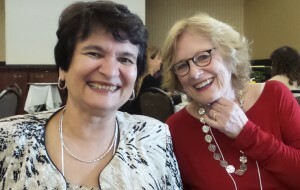 Congratulations and thanks to Jane Pfeiffer Russell, AAUW-NYS Program VP and the Convention Team for an excellent AAUW NYS Convention held on April 17-19, 2015 at the Byblos Niagara Resort and Spa Grand Island, NY. Jane was the Moderator on Saturday Morning Panel of Municipal Leaders which included special guest, Kathy Hochul, NYS Lt Governor; Marjory Jaeger, Amherst Town Clerk; Julie Huntsman, Otsego Town Council; Crystal Peoples-Stokes, NYS Assembly; Lovely Warren, Mayor of Rochester. The speakers were very informative and inspirational. As you may know, in 2011, Jane was elected Supervisor for the Town of Pulteney. When taking office the Town was in arrears financially $20,000 and upon leaving office at the end of 2013 the coffers held over $300,000. She has been a staunch advocate for antifracking in NY and held a position on the steering committee for Elected Officials to Protect NY. During that two years much time was spend in lobbying the Governor, the NYS DEC and the NYS DOH as well as local advocacy events. Jane joined AAUW in 1976 when she moved back to Steuben County and has held many local and state offices, including that of AAUW NYS Program Vice President in the early 2000’s. She was part of the then widely visible “Living the Mission” program developed by the NYS Board under Evvie Currie’s presidency. The International Day of the Girl honors and celebrates girls around the world – elevating the status of girls in our local and global communities, and addressing key issues related to girls’ empowerment, leadership and success. In December 2011, the United Nations General Assembly adopted a resolution to establish October 11th the “International Day of the Girl Child.” This day, the General Assembly noted, is about “helping galvanize worldwide enthusiasm for goals to better girls’ lives, providing an opportunity for them to show leadership and reach their full potential” (UN GA Resolution 12.9.11). This October 11th, 2012 marks the first commemoration of this historic day! Ask girls’ programs — schools, Girl Scouts, STEM programs, clubs — to join hands with others. This entry was posted in General and tagged International Day, United Nations General Assembly on September 17, 2012 by wahtera.